In the Arkansas case, legislation was enacted in 2015 proposing the erection of the monument. But what's interesting, is in the legislation, a dictate is made to designate an outside, third party legal team, the "Liberty Legal Institute." 14 from §§ 22-3-301 et seq. and 22-3-501 et seq. 20 a legal defense of the monument. 22 present a legal defense of the monument shall not be subject to § 25-16-702. 25 or denomination over others. In the end, the state loses in court, but the Liberty Legal Institute wins and gets paid well. It's safe to assume that same organization probably also contributes to various politicians election campaign efforts. 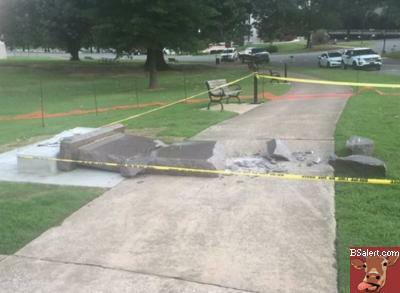 To add further insult to injury, the Arkansas man who destroyed the monuments, contrary to what right wing media are claiming, is not an atheist, Muslim or secularist. He's a Republican Trump supporter who is a devout Christian.